Our quilt show is held approximately every two years. The next show will be in 2020. UnFinished Object: those "I love that' quilted objects most of us have started that are somehow still in a bag, box or drawer for who knows how long. The UFO Challenge wants to gently help you complete 4 UFO projects over the next 12 months. Workshops are held the Friday following the guild Thursday meeting each month. workshop fees are to be paid at the time of registration. Signups for workshops are held at the general meetings preceding the workshop. Subject to change. Unless otherwise directed, classes are held at Quilt in a Day. Non-members may sign up 60 days prior to the workshop provided space is available. Please contact the Workshops Chair. Friendship Groups are the key way to get connected within the guild, build new relationships and share and develop quilting skills. Contact the Friendship Circle Chairperson to find a friendship group to join. A drawing is held four times per year for the Friendship Block recipient(s). The winner(s) selects a block pattern and provides instructions and fabric as desired. Members volunteer to construct and donate the block. Those eligible must have belonged to the guild for at least six months and have completed at least two friendship blocks during the preceding two years. The first recipient each year is the longest participating member who has never won. The Guild holds a creative quilt challenge annually based on a guild selected theme. On the year that the guild does a quilt show the challenge quilts will be displayed at the show. During the year that we are not having a quilt show the challenge is done as a fun activity for members. The 2018 challenge was "A Quilter’s Tribute to The Beatles." A block pattern is published each month in the newsletter. Members are encouraged to make a block (or several) to turn in at the next meeting. Members receive one chance, for each block they turn in, to win a set of blocks. One set of blocks per participant per drawing. The 2019 Blocks are traditionally pieced using a stripe and floral fabric. If you make two blocks, one for guild and one for yourself, you will have a quilt top at the end of the year. For everyone who finishes and shares their finished quilt top we will enter your name for a prize. If you need help, please call or email Cherie Brown or Mary Brothers, and they will answer any questions you may have. The 2019 Opportunity Quilt is designed by our very own Guild Member Karen Brow. This 58” x 64” hand appliqued beauty was constructed by the team of Corinne Yarborough, Sherrie Smith, Linda Scott, Ellen McGrath-Thorp, Ruth Hickman and Karen Brow-Meier. Made from rich Hoffman batik fabrics, it is custom quilted by Sherrie Smith. The quilt is available to take to other guilds during 2019. If you are interested, please contact Karen Brow-Meier or Ellen McGrath-Thorp. Ticket prices are: $1 each, $5 for 6, $20 for 25. Tickets may be purchased by sending a check to El Camino Quilters. The drawing will be held the second Thursday in December. Winner need not be present to win. El Camino Quilters has a quilt composed of blocks made by members of the guild. Every member is requested to make a block. See the document below for the instructions. 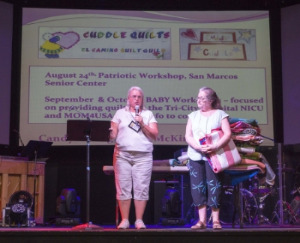 Quilts made by guild members are donated to a variety of organizations such as; The Polinski Children's Center, Alzheimer's Association and the Tri-City Oncology and Neonatal Units and many other organizations. Other philanthropic activities are undertaken periodically to support the community. In memory of Fern Gibbs, her pattern titled "Any Scrap A-Doo" is available here to anyone wishing to make charity quilts. Each year in February the guild arranges for a retreat at Temecula at Viña de Lestonnac Retreat Center. It is lots of fun and a great way to meet others in the guild. Use this link to go to the Forms page for more information and the form to sign up. A silent auction is held once every two years. The silent auction alternates years with the quilt show. It is a time when members donate items to the guild and other guild members bid on them. The highest bidder pays the guild for the item and takes it home! The guild uses the money raised by these donations as one of the major fund raisers. This year we are having a triple chance for fun and a bargain shopping experience! On June 13, 2019, we will host our Silent Auction, Fabric Sale, and Boutique! This will be at our regular Guild meeting place, QLN in Oceanside. Bring your quilting friends and join in this unique opportunity to shop for that special treasure. Admission is free.